A 4x4 at Robert Moses Beach. Photo by Kelly Tenny. Off-roading is a popular pastime, but on Long Island off-road vehicles can only be used on public lands under very specific circumstances. Four-wheel drive vehicles are generally not allowed to be driven on Long Island’s parks and beaches, but there is a set of conditions under which 4x4 owners can access several beaches. Fishers with 4x4s are allowed to use their vehicles for the purpose of carrying fishing equipment after obtaining a Four-Wheel Beach Driving Permit from the Office of Parks, Recreation, and Historic Preservation. The permit must be renewed annually and expires on December 31st regardless of the date it was issued. Recently the state has begun offering 4x4 vehicle permits for the purpose of carrying surfing equipment as well. 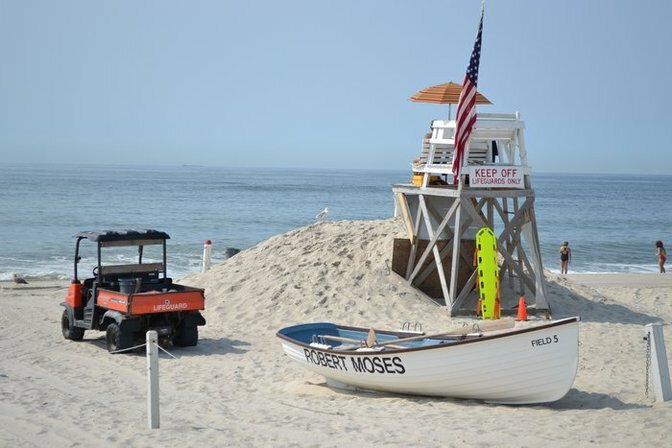 Robert Moses: Democrat Point only, from April 1st - December 31st sunrise to sunset (Must enter before 7 am or after 5 pm from Saturday of Memorial Day weekend thru Labor Day; and Field 2, 3 & 4 from September 15th - December 31st for access to parking lot. The permit costs $65 for NYS residents and $110 for non-residents. A valid vehicle registration card and the registered owner's driver's license are required for purchase, and you must be 18 or older to obtain the permit. Robert Moses: Democrat Point from April 1st - December 31st, open 24hrs. Must enter before 7 am or after 5 pm from Saturday of Memorial Day weekend to Labor Day; and Sore Thumb from April 1st - December 31st, 24-hr. access. Permits cost $65 for NYS residents and $110 for non-residents. To acquire a permit you must have a valid vehicle registration card, the driver's license of the vehicle's registered owner (for NYS residents), and show proof of (free) enrollment in NYS DEC Recreational Marine Fishing Registry. Due to beach erosion, Gilgo Beach has been closed to 4x4's indefinitely. 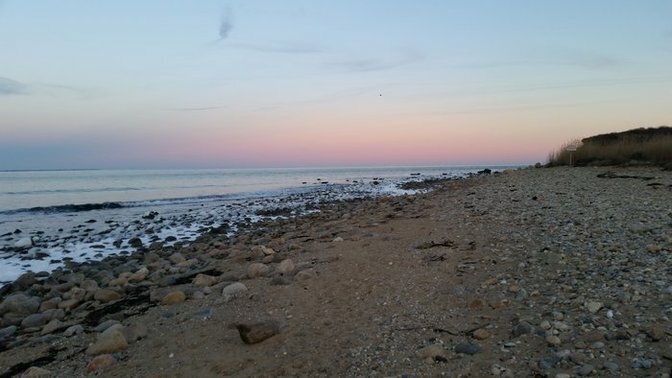 Montauk Beach at sunset. Photo by Joe Galletta. Tires are not allowed to exceed 33 inches in diameter or 12.5 inches in width at any point. Before passing the Beach Vehicle checkpoint location, tires must be aired down to half of the maximum rated pressure. Drivers are not allowed to pass through bathing areas between 7 AM and 5 PM from the Friday before Memorial Day Weekend through Labor Day at specifically designated parks. While at the beach, drivers must follow designated access roads and may not exceed 10 miles per hour. 4x4s are only allowed to access fishing or surfing areas and may not be used to travel elsewhere. They are prohibited from driving over dunes, wetlands, beach grass, bird nesting areas, seal haul out areas, and sand fences. Drivers must stay to the right of oncoming traffic and give pedestrians the right-of-way. 4x4s must be carrying fishing equipment (including rods and reels) or surfing equipment, a portable toilet, tow rope or tow chain, jack, jack board, shovel, and a tire gauge (able to register a minimum of 5 PSI) when traveling over beaches. ​Vehicles must use approved tires and spare tire. Do not destroy the sand fence, and take trash with you to discard in trash receptacles. New York State will not replace lost, stolen, or revoked permits, and duplicate permits are not issued. Those who do not comply with Long Island State Park Driving Permit Conditions will have their permits revoked for a period of one full year. The Long Island State Park Headquarters Permit Department is located in West Babylon at 625 Belmont Avenue and can be contacted at 631-669-1000. The Long Island State Park Headquarters Permit Department is located in West Babylon at 625 Belmont Avenue and can be contacted at 631-669-1000. The Montauk Downs park can be contacted at 631-668-5000. Robert Moses State Park and Gilgo State Park can be contacted at 631-669-0449. The Four-Wheel Beach Driving Permit and the Night Sport Fishing Permit also allow the holder to park at the specific locations between sunset and sunrise for fishing only, from April 1 to December 31 unless otherwise noted.